The 2015 winners of the Prix Arts-Affaires were announced yesterday afternoon at the Maison du Conseil des arts de Montréal. This event aims to promote ties between cultural organizations and the business world. 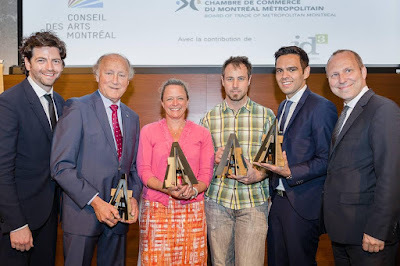 According to Jan-Fryderyk Pleszczynski, president of the Conseil des Arts de Montréal, “this year’s winners reflects the diversity and sense of innovation shown by people and enterprises in their commitment to arts organizations”. The winner of the Entreprise category, sponsored by Fondation Pointe-à-Callière, is Ivanhoé Cambridge. The real estate company supports organizations that protect the city’s architectural heritage, and work frequently with McCord Museum and Héritage Montréal. The PME prize was awarded to Tampopo, sponsored by Les Productions Quitte ou Double. Tampopo supported the young theatre company’s production of Dragon d’Or by serving low-cost meals during the 15 representations. André Bourbeau, sponsered by Jeunesses Musicales Canada, is the winner of the Personnalité Arts-Affaires Prize. Mr Bourbeau has been their president for almost 20 years, and has organized several fundraising events for the JMC. He is also the founder of the Montreal International Music Competition (MIMC). Charles Milliard, sponsored by the Festival TransAmériques (FTA), won the Bénévole d’affaires prize. Mr Millard has served on FTA’s administrative board since 2010, and has presided over two fundraising events in 2013 and 2014. He is currently vice-president of the FTA’s administrative board, and president of their finance and development committee.